I’m the mom of Dash (7 years old) and Georgia (4). I also lead Blend’s Employee Experience team, which is comprised of Internal Communications, Employee Experience, and Facilities. Those might seem like dueling roles, but with some good boundaries and epic wins (and fails) in my rear-view mirror, every day I’m able to bring my whole self to work. My mission is to normalize parenthood – especially motherhood – in the tech industry. That might sound like a bold claim, but it’s not really. In tech, motherhood is uncommon and can be a challenge in a few ways: typically there are long hours in a male-dominated field, where many colleagues are younger than I am. But I looked long and hard to find a company that was aligned with my career goals (I wanted to build out a function top to bottom) and valued a flexible working environment (I can work from my kitchen, our New York office, or the couch on the 4th floor). I found all of this at Blend. When I joined a little over a year ago, I was employee #130 and was the third mom hired. I decided not to hide my family life (namely Dash, Georgia, and husband Jamaal) and share with my mostly-younger and childfree colleagues what it’s like to be a working mom. I could have decided to share only my professional-self (earlier in my career, I was afraid of getting fired over my frequent, albeit required pre-natal doctor appointments) but that wasn’t in line with my personal values or Blend’s value of bringing our whole selves to work. I go on field trips with my kids and encourage the parents on my team to do the same. Work can wait – your 3-year-old’s on-stage performance at the summer camp dance recital cannot. I have pictures of my kids on my desk. I talk about them (they give us endless morning coffee fodder). I leave early on Wednesdays to coach my son’s soccer team. There’s also the other side of the coin – I usually start work around 6 am from my kitchen table while those babies are still sleeping. I often get back online after the kids go to bed. I work as hard as I possibly can during my time in the office so I can enjoy my evenings with my husband and kids. By embracing my role as a working mother, I can straddle both worlds with purpose and enjoyment. The tech industry isn’t always easy to navigate as a parent, but I think you can make it a winning experience for all involved. I chose Blend because I wanted to work at a company that valued everyone, even the parent – we offer 16-week paid family leave, free MilkStork delivery when traveling for work, and the ability to have a flexible schedule so you can make it all work. A few months back, we started our Employee Resource Group (ERG) programs. ERGs are employee-led groups that foster a diverse, inclusive workplace aligned with organizational mission, values, goals, business practices, and objectives. Our Parents @ Blend group’s mission is “to build community, raise awareness and impact change for caregivers within Blend and beyond.” We also have Pride @ Blend, Women @ Blend, and Blackchain @ Blend. These ERGs give our under-represented communities a voice and a place to just be. When we walk into our Parents meetings, we stop talking about potential customers, sprints, features, and opportunities for our business. It’s a place where we can talk about summer camps, bedtime, how to get a 2-year-old to eat a nutritious dinner, and which tactics we can use to encourage our co-workers not to schedule meetings at 6 pm. I come from a long line of companies that celebrate parents and families in the workplace. 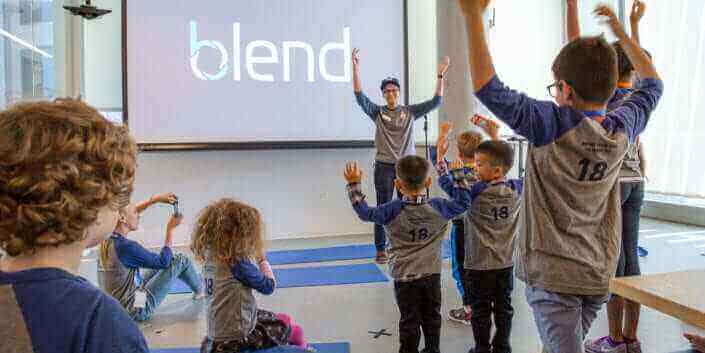 With years of ideas in my head, I had been waiting to plan our very first Bring Your Kid to Work Day since I started at Blend. BYKTWD is an opportunity for your kids to come and spend the day with you in the place where you spend the majority of your time. I found that bringing my kids to work with me allows them to understand me better – when I travel for work, or leave before they wake up, or bribe them with M&Ms in the car so I can take a call with an executive – they know why it’s important. They know they share me with a rapidly growing fintech company across the bay. Alternatively, when my kids come into the office, my colleagues develop a bit of empathy for the two roles that I have. We enlisted the 34 parents involved in the Parents @ Blend ERG and brainstormed a fun and fulfilling day for our kids and co-workers alike. We didn’t want to have a bunch of kids following their parents into meetings and playing with iPads at their desks. We wanted to develop that concept of organizational empathy that is so important – this opportunity is to spend the day with your kid while showing them what their future can look like. (Dash spent time with Greg, an InfoSec engineer who taught him to make the best paper airplane ever. Now he obviously wants to be an aeronautical engineer.) Throughout the day we had coding and design workshops differentiated by age; we had a roundtable with the middle school-aged kids and our New Grads in an AMA format; we had a yoga class and scavenger hunt; we took advantage of the city park behind our office and indulged in ice cream sundaes. 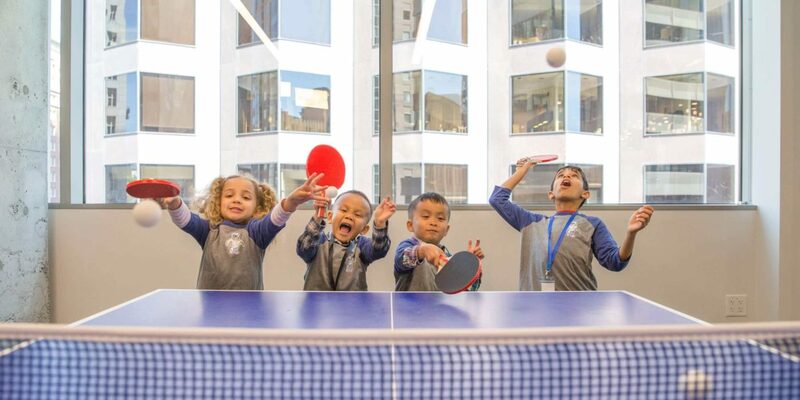 And who knew our ping-pong room was going to be the spot for the best multiplayer game of ping-pong ever (with about 12 balls in play at once)? 34 kids (ages 1-13) spent the day in our office. I can’t imagine a better way for my kids to understand where I go during the day, and why I do what I do. Here’s to raising the next generation of hard-working humans who will no doubt bring their whole selves to work. Laney Erokan (she / her) leads the Employee Experience team at Blend, encompassing Internal Communications, Employee Experience, and Facilities. She is a champion of Blend’s culture and principles — all while sipping on a nitro cold brew.